Hawaii Promotion Committee : Hawaii, 1916. This unpaginated publication has general tourist information augmented by numerous photographs; mostly very small, sometimes cropped, and not all have titles. The photograph Outrigger Club (page b) is said to show the celebrations for the new Outrigger Canoe Clubhouse in August 1915, hence the publication is dated circa 1916, although some of the photographs are probably several years earlier. - DeLaVega: Surfing in Hawai'i (2011) page 51. The photograph, Surfing (page a), is copyrighted 1911 by J. J. Williams, one of the early Hawai'ian photographic studios. Tim DeLaVega notes that the standing surfer to left has been added from another photograph, an example of William's photographic manipulation by masking objects, to add or to remove, during development. He reports that the surfer has been said to be Jack London, but doubts this based on London's writings and the 1911 copyright. However, given that the studio did seven maniplations of the image, he suggests "that it was someone of importance." - DeLaVega: Surfing in Hawai'i (2011) page 68. The wide panorama, On the beach at Waikiki (page b), shows a steel tower to the far right of the Moana Hotel pier, no doubt constructed by members of the Outrigger Canoe Club for M. Bonvillain of Pathe to the film surf riding in 1911. On the 13th February 1911, the evening before the second Clarke Cup contest at Waikiki, a 24 ft steel structure was ferried out to the reef on the largest available canoe, the crew , with their "hair parted in the middle," accutely aware of the need to maintain balance. Through design or accident, a wave upset the load and the scaffold was deposited at "in the midst of the big breakers." In addition to the large platform on the reef errected for Bonvillain, a small one was to be placed in front of the Moana Hotel. 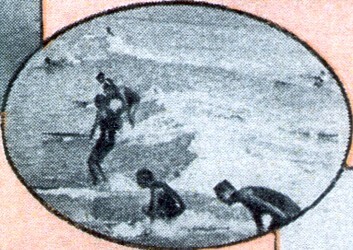 The cropped untitled surfing photograph (on page b) has an elevated perspective that is characteristic of a number of images of the period, probably taken from the end of the Moana Hotel pier. 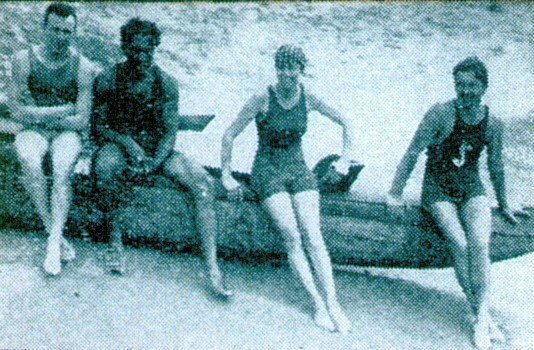 The photograph Canoeists (page c), includes of a woman and three males, one who is likely Duke Kahanamoku, second from the left. The Hawaiian Islands truly present a sportsman's paradise. The island waters teem with the gamiest of fish. The Hawaiian Tuna Club of Honolulu is numbered among the live institutions. When one considers that the United States fish commission has described 477 distinct species of fish belonging to the region of the Hawaiian Islands, exclusive of deep-sea fish, it can be readily seen that the waters offer excellent opportunity for the sportsman second to no other section within the sisterhood of states and territories. ands have become a recognized rendezvous for mainland game fishermen who have made world's record catches of tuna, ulua, dolphins and swordfish, and fishing headquarters have been established at Kihei, Maui, others on Hawaii, Kauai and Oahu. Yachting and aquatic sports can be indulged in all the year around. Under the auspices of the Hawaii Yacht Club, three noted trans-Pacific yacht races have been sailed, which brought much favorable publicity to the islands. In addition to several boat clubs, a number of rowing organizations and the Outrigger Canoe Club have a large membership. A great and distinctively Hawaiian sport is surf-riding, either with a board or a canoe. It is one of the principal attractions at Waikiki Beach, Honolulu. "ON THE BEACH AT WAIKIKI." Access to many off-shore fishing banks, reefs, shoals and channels, located close to all the islands, has been made by power sampans which may be secured at Honolulu and other principal seaports. Shark hunting is much exploited in Hawaii and only requires a power boat, a party of tourists and a harpooner to make up an afternoon of exciting sport. The Territory of Hawaii boasts of many athletic organizations. It has turned out some of the world's best swimmers, chief among whom is Duke P. Kahanamoku. Honolulu and Hilo have large infiuential country clubs. Golf, tennis, baseball and polo, and a host of out door games are played, throughout the year. Travelers, whose hobby is golf, have opportunity to play every month of the year on many superb links. The Oahu Country Club of Honolulu has a splendid 18-hole course. The Moanalua Garden links and those at the Haleiwa Hotel, are always popular. "ON THE BEACH AT WAIKIKI." The bathing beach at Waikiki, about three miles from the business center of Honolulu, is world-famed for its water and the unique sports there indulged, surf boating and surf board riding. The temperature of the water is close to 78 degrees the year round. The beach is almost entirely free from inequalities, running out slowly to deep water. There is no under. tow, so bathers are safe. From the outer reef to the shore, surfing forms the principal sport. The sharp outrigger canoes of the Hawaiian natives, guided by experts, are so turned in front of a breaker that the wave furnishes the impetus which drives the canoe straight toward the shore. This forms one of the most exciting aquatic sports favored by tourists. Surfing adepts take a long pointed board, giving to it the necessary forward motion to enable the inrushing wave to bear it shoreward on the crest. Often the rider will stand upon this slight support. The entire beach at Waikiki is enclosed by a great barrier reef of coral which effectually guards the bathers from possible intrusion of sharks, which are never seen in the lagoons. There has never been a casualty from sea monsters on or near any of the bathing beaches about Hawaii. The famous song "On' the Beach at Waikiki" was composed to describe the allurements of this wonderful coral sand stretch. Adjacent to the bathing beaches are many of the fashionable hotels, frequented by the army and navy, and the local and foreign elite. Geoff Cater (2013) : Hawaii Promotion Committee : Hawaii, 1916.